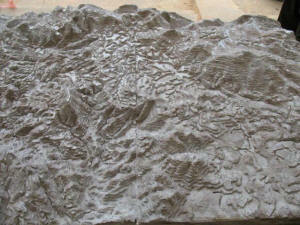 This 1:20,000-scale (1.5 X vertical exaggeration) Participatory 3D Model (P3DM) of the Das-Chais Commune was completed in July 2009. The commune is located close to the Bi Doup-Nui Ba (BD-NB) Nature Reserve in Vietnam. 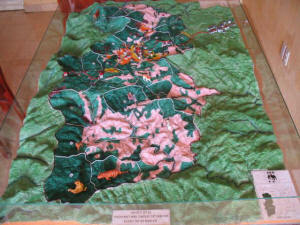 The model which covers a total area of 720 sq km was built by representatives from the Das-Chai commune, park ranges from the Bi Doup-Nui Ba (BD-NB) Nature Reserve and project staff in the framework of the project “Collaborative management of forests and wildlife in Vietnam” funded as part of the Darwin Initiative. The model has been used to deal with land use planning issues that are facing the commune – such as the conversion of a prime wetlands site to agriculture (Source, IIED). 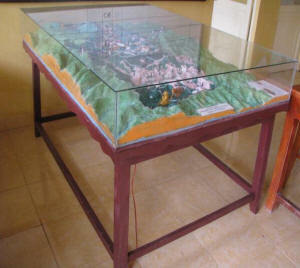 The Model has been produced by local stakeholders in the framework of the Project Co-management of Forests and Wildlife in the Bi Doup-Nui Ba (BD-NR) Nature Reserve, Vietnam (July 2007 to October 2010). Through IIED and WWF-GMS, the project has taken steps to develop and implement co-management approaches to work with communities that succeed in providing incentives for sustainable land use both in the buffer zone and the protected area (source, IIED).